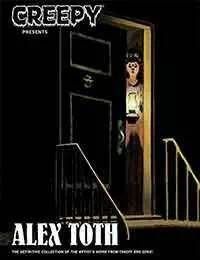 A brilliant storyteller who wielded a dynamic, minimalist style, Alex Toth is considered a master in the fields of comic book storytelling, animation, and design. With Creepy Presents Alex Toth, all of his vibrant and thrilling stories from Creepy and Eerie are collected in a deluxe, magazine-sized hardcover for the first time ever! With an introduction by Darwyn Cooke (DC: The New Frontier, Richard Starks Parker), this collection of timeless tales will thrill, educate, and excite fans of horror, comics, and stellar illustration work. Major collaborations with Archie Goodwin, Doug Moench, Carmine Infantino, and others are included!